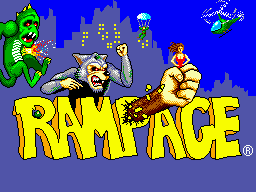 Rampage is an arcade game which was ported among other consoles to the Sega Master System. The player controls either Ralph the Wolf, George the Ape or Lizzie the Lizard, and must destroy buildings and vehicles and eat people. Rampage was followed by Rampage World Tour.